A&W Drive-In | Out to Eat | Kids VT - small people, big ideas! Three-year-old Gracie Lambert of Rochester gets in the spirit of fast food at the A&W in Middlebury with her mom, Nicole. We were driving across the country last summer when, somewhere in Wyoming, my kids spotted an A&W and begged that we stop. A restaurant that is also a brand of root beer was a must-see for a pair of 9-year-olds. Dreading yet another road-trip burger and fries, I kept driving, assuring them "we could go to A&W some other time." Last weekend I was reminded of my promise, when the twins spotted the A&W on Route 7, south of Middlebury. They demanded I stop because I had promised I would take them to an A&W. "Some other time" had arrived. For me, it had been 30 years. But as I pulled up to the drive-in, I noted how little the place has changed. Though no longer on roller skates, the waitresses still come up to your car to take the order. The food still arrives on a tray that hooks onto the car door. The root beer and floats are still served in thick — but no longer frosty — glass mugs. Everything — except my metabolism — was just as I remembered it. When I opened the window to order, the smell of fried food wafted in. As if intoxicated by it, my son started chanting, "This is going to be so good. This is going to be so good." He ordered a chili-cheese dog, but no fries, because he wanted "to leave enough room for a root-beer float." My daughter got a burger basket that came with fries, a side of coleslaw and a medium mug of root beer. I skipped the culinary trip down memory lane rather than pay the gastric price for a meal heavy with grease, sugar and full-fat dairy. "But a stomach ache would totally be worth it," my daughter rationalized as she dipped her burger and fries into ranch dressing. That's easy to say if you're not suffering from acid reflux. In some ways, the drive-in is a great concept for families with small kids. Parents don't have to stress about long waits for food; there are no worries about offending other patrons with loud voices and poor table manners. 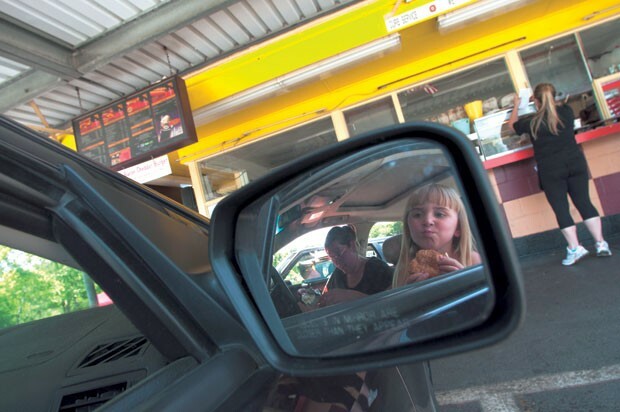 But there is a downside to in-car dining, as I discovered soon after our food arrived. The inevitable dining detritus of two 10-year-olds was now in the car — my husband's, as it turns out — and I'm pretty sure the smell will linger through summer. My daughter sloshed root beer out of the heavy open-topped glass mug almost instantly, and I spent the entire meal mopping up spills. If only I'd had the foresight to take our lunch to one of the dozen picnic tables on the south side of the restaurant. But the kids were overjoyed. Based on the happy sighs and exclamations coming from the backseat, the food was everything they had dreamed of since last summer in Wyoming. The only thing left behind was a pile of root-beer-and-catsup-sodden napkins and the little container of coleslaw. I ate the slaw while they talked about what they would get next time they came to A&W. Six years from now, they'll be driving up in their own cars. Family-friendly amenities: Kids meal, which includes an entrée, small fries and small drink. The drink comes in a special cup with a straw.